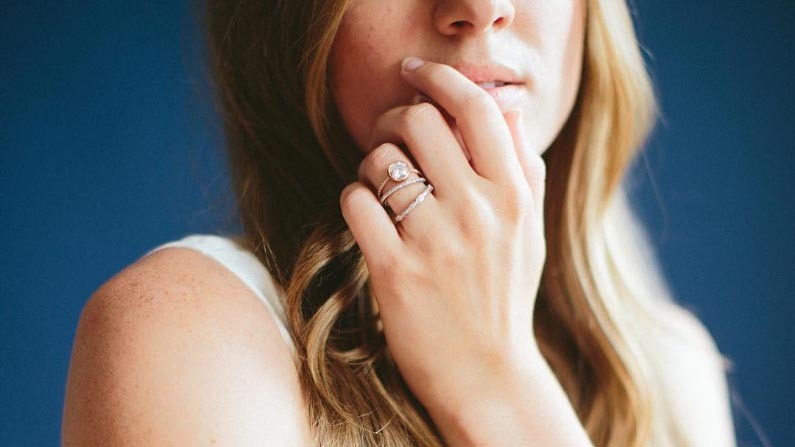 Thinking about wearing two wedding bands with your engagement ring? 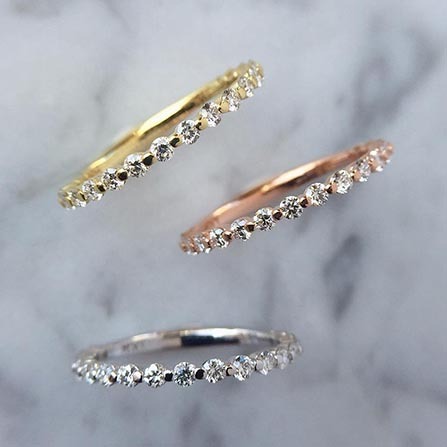 Stacking wedding rings is more popular than ever and it’s a great way to add extra style. We love the look of a well-executed stack of rings, but it’s important to pick the right pieces to blend together. This quick guide will tell you some of the most important things to consider when opting for two wedding bands instead of one. A large wedding band/engagement ring combo can take up a lot of real estate as it is. Under those circumstances, it’s very easy for the addition of a second band to become “too much”. At Honey, we tend to lean toward daintier wedding bands in general. First of all, we don’t want a secondary ring to steal too much focus from an engagement ring. Second, we love how much freedom they give in terms of stacking. Thicker wedding bands can really limit what you can do without things starting to appear clunky and overbearing. More delicate bands give you the room to experiment and they open the door to limitless looks. Our Maven wedding band is one of our favorite dainty ring examples. We designed it to be super stackable with the perfect shank and diamond sizes. This flexibility means that you can double up on Mavens or pair one with almost any other wedding band. Admittedly, we do love our made-to-order wedding jewelry. It’s absolutely what we’re all about and we love it. The proof is in the pudding. But this is good advice no matter if your working with us or with another great jeweler. We can say with 100% objectivity that custom wedding bands are the best way to get a clean look, especially when a second band is added. The aesthetic flow created by the perfect wedding band/engagement ring pairing is a beautiful thing and there’s no better way to achieve it than with custom work. A good jeweler will help you match lines, metals, and stones to get a seamless look. And this doesn’t mean that you always have to create a whole new piece. There are plenty of great designers who make it a point to create lines of purpose-built wedding bands to pair perfectly with their engagement rings. Your wedding bands are going to be with you every day. The little bit of extra effort that goes into a made-to-order band is always worth it when it’s all said and done. A perfectly symmetrical double wedding band presentation is awesome for creating an extremely clean look. It’s also an ideal way for even the most traditional wearer to confidently add that extra ring to the equation. The most straightforward way to achieve symmetry is to simply flank your engagement rings with two identical wedding bands. This is an awesome look, but you don’t necessarily need two of the same band to keep things symmetrical. Two different bands of a similar thickness can be an outstanding way to mix things up a bit while maintaining the perfect balance. We love pairing our Maven and Lorraine rings together in this way. These two have similar sizes, but totally different styles. It’s also worth mentioning that there can absolutely be circumstances that call for selecting two wedding bands that differ in thickness. For example, an asymmetrical engagement ring can often be balanced by carefully selecting two wedding bands that fill out the stack. Sometimes the best way to spice things up is to venture out and make a bold statement. If that sounds like your style, a double wedding band stack is the perfect place to make it happen. One of the best ways to make a statement is to select a bigger diamond eternity band for one (or both, if you’re really feeling it) of your wedding bands. Something like a Chloe, our fan-favorite oval diamond band, is a knockout option here. No doubt that adding this to your stack will turn some heads. The other obvious way to make a statement is adding some variety to shapes or colors. Maybe a V-shaped wedding band on the bottom and a traditional band on top. Or maybe you opt to alternate colors of golds in the stack. The combinations are pretty much limitless and this is another area in which it pays to have the help of a talented designer. A professional opinion and a second set of eyes can save you a lot of stress if you’re on the fence. This is especially true if you’re dedicating a lot of resources to the wedding bands. Surprising as it may be, practicality is one of our favorite reasons to opt for double wedding bands. There are plenty of occasions that sensibly call for wearing both wedding bands while dropping your engagement ring from the stack. Travel is a great example. It’s extremely common to leave an engagement ring at home during a trip, whether it’s for safety or for comfort. This is a perfect time to wear two wedding bands. Whether you drop the engagement ring for utility or for a simple change of pace, doubling up on bands makes for a nice in-between. Our favorite way to execute this style is to pair a bold ring with a more delicate one. A bigger diamond eternity band worn alongside a smaller, simpler band works beautifully. If you’re still hungry for more wedding jewelry ideas and inspiration, we’ve got you covered. We have a full line of custom wedding bands to help you find the perfect combination for your stack. We can also help you find the perfect engagement ring. Our custom engagement rings come in all shapes and sizes. We’d love nothing more than to help you design and build your dream ring. Now that you’ve got some extra pointers for pulling off a two-wedding-band look, go make the leap!